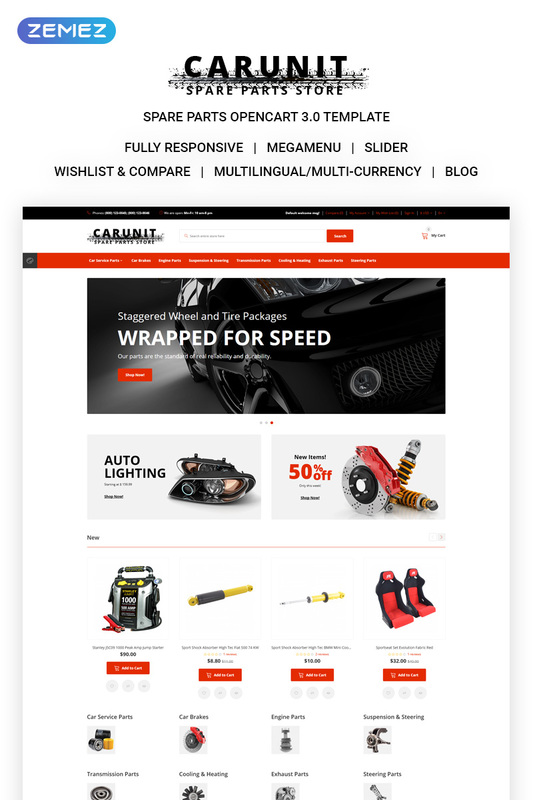 AutoCart – Spare Parts Store OpenCart Template is professional minimalist responsive OpenCart Theme built to create modern powerful e-commerce web-site. Theme has a bundle of functioning features of a modern template for multipurpose in building a website and supporting the latest version of OpenCart 3.0.x. Including 1-click (QuickStart) to get a replication of our theme demo site on your website with same content, graphics, theme settings & layouts. It is powerful ThemeCustomizer with flexible settings, fast loading, premium modules, fast support and much more. With our awesome template your customers will understand at once that they deal with professional. The original design of functional buttons warms up users’ interest. Expensive cars in the slider fantastically decorate the layout. Four marketing banners advertize the offers appealing experienced drivers. Dark textured background makes the design expensive and sophisticated. Visual slider effect on image transition really strikes the imagination. Four marketing banners have hover effect. Featured products are standing in four columns. Essential info about store discounts is above the footer menu. Black is a synonym of high-quality and reliability according to color psychology, so this theme will assist strengthening your position in international e-Commerce. Company logo is professionally designed and worth your attention. Cool speed bikes are displayed in slider gallery. Trusted brand names and product categories are placed onto clickable banners. Tooltips appear on hovering Featured products. Black and white layout of this store is revived by bright yellow elements. They draw visitors’ attention and serve aesthetic purposes. Top quality products are advertised in slider gallery. Banners have roll over effect. Featured products are placed in five columns. Main drop down menu and footer menu provide all possible links to simplify customer’s navigation. Our professional design will make your store popular among the drivers community. Accurate, sharp lines keep the layout clean and ordered. Banners are supplied with zooming effect. Slider advertises brand items. Featured products are provided with bright yellow price tags and two square functional buttons. In addition to main drop down menu, footer contains subsidiary navigation links. Black color present in the layout makes it more expensive and luxury, especially in combination with the background pattern. Logo has stylish elegant design. Categories and brand menus in the left sidebar considerably simplify customers’ navigation. Slider beautifully advertises best store offers. Social media sharing options are in the footer together with subsidiary menu. This template can be called boring in no case. Bright colors, bold fonts and interactive elements make visitor’s shopping experience interesting. Much attention is paid to navigation. It is possible to search by brand, bestsellers and product categories. Main menu is supplied by icons. Featured products have zooming effect. Slider advertizes tires from the best manufacturers. The template is designed in grey scale with bright red elements guiding visitor’s eyes through the layout. All banners and product images have zooming effect and interact with the user. Slider shows spares together with descriptions. Categories and footer menus make the navigation simple and user-friendly. Blurred image of an office ceiling is discernible in the background. Black and yellow is a super powerful color combination for e-commerce. Abstract pattern in the background makes the design look expensive. Slider images are supplied with descriptions and call-to-action buttons. Categories search is available in the left sidebar for buyers’ convenience. Featured products, standing in three columns have zooming effect and three functional buttons. This template has very interesting, uncommon design. Its elements of irregular shapes catch visitors’ eyes. Black and red color combination is very powerful and efficient. Banner and featured images have zooming effect. Red arrows draw customers’ attention to footer links list. Slider images are supplied with descriptions. Sharp corners of design elements speak about accuracy of sounds played back by the offered audio gear. Sleek black layout with effective yellow elements will drive more clients to the car store selling auto parts, audio, tires wheels. Visual accents guide the visitors seamlessly through the layout, emphasizing the price of products, featured blocks, chosen categories in the left sidebar. Large slider showcases top products, making potential clients interested in them. Drop down menu and good search mechanism facilitate users work with the theme.